Music is a universal language. No matter what country you are from or what form of dialect you speak, music can touch souls and be listened to by everyone, regardless if you can understand the words or not. With this being so, music comes in many forms and continues to evolve throughout the generations. The pressure in the music industry has always been to create the newest, most creative style of music and present it in a fresh approach. The expectancy violation theory explains one’s reaction to an unexpected event or behavior. Violating this is a tactic that is actually the objective for many artist today. Catching viewers off guard by showing them something different they would never expect, is what sells records. 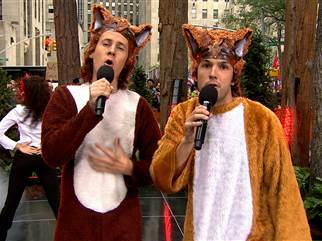 Bard Ylvisaker and his brother Vegard accomplished just this when they posted their Youtube video “The Fox.” Their goal was to create a funny video by singing about something totally random in a serious looking manor. The video by the Norwegian duo was never expected to reach the popularity it did, having more than 120 million views to date. What set this video and song apart from the other millions of video’s that have been posted to Youtube, is the fact that it does exactly what this theory states, it violates all expectations viewers had prior to watching it. Who would have guessed by simply looking at the title “The Fox”, that this video would take something random such as the sound made by a fox, and create a serious and professional music video revolving around the amusing topic. Saying the video has gone viral is an understatement. The brothers and their video have done everything from playing live at a Lower East Side club, to making appearances on the Today show, and even having an article written about them in the world-famous magazine Rolling Stone. They quote in the magazine “We’re exhausted, but like, a happily exhausted.” The popularity of this music video has thrown them into a whirlwind of publicity, with their appearances being sought after as the hottest thing to date. Youtube was the perfect platform for a video such as this. Having the visual addition of the music video to accompany the song are what made this concept such a success. A song such as this would have never became such a hit if it were to have been included on a CD track list. As music evolves, so does the ways in which is it presented to the public and the Ylvisaker brothers hit the musical jackpot with their creation, and presentation of this song.